Back when I started writing articles for A Technophile’s Indulgence, I was a failing chemistry student whose interest in computers had often left me astray from what I was meant to be studying. While I had been writing articles for other audiences for a couple of years by that stage, A Technophile’s Indulgence was the first time when I set a consistent schedule (or at least mostly consistent – there have been some changes or omissions from the fortnightly schedule, often because of exams) for my writing. Nevertheless, I never would have guessed that I’d still be blogging on this site and consistently writing articles today. Today, I’m a rather more academically successful student of Information Systems and Information Technology. The adjustment to a computer-related degree course wasn’t really all that unexpected; even when I started writing on this blog, I had expected that I would have to have some sort of contingency plan. What has been somewhat unexpected is the sharp jump in academic performance – from barely passing (or in the case of my first attempt at second year or my attempt at third year, not even then) to consistently high marks, some of them top of my class. Strictly speaking, this isn’t the third anniversary of when this site was set up; that anniversary occurred about three months ago, commemorating the occasion when I started the site to host the first chapter of a short story I was then writing. However, having grown displeased with my progress on the story and indeed with the material I was writing, I removed the story and decided to repurpose the site as a repository for my first series of articles that I had written after finishing my exams in May 2009. A common theme can quickly be established between most of the top 10 articles – they are all technical in nature, as opposed to the less technical side of the site manifest in my reviews of games and movies, along with my fictional writing. A few other common elements can be identified – with the exception of the post on “My first fortnight with the Raspberry Pi”, which was very much an introspective post, all of the articles are fairly heavy on the technical talk. This is especially true of the posts on C programming, which are straight-up tutorials on how to use various elements on the C programming language, and the Historical Operating Systems series, which I feel has never backed down on what makes an operating system memorable, including the technical aspects. Most of the posts are also written in a very serious style, the notable exceptions in this list being the Probing The Inaccuracies articles which incorporate a ranty style which was intentionally designed to invoke responses when I was writing for other sources. 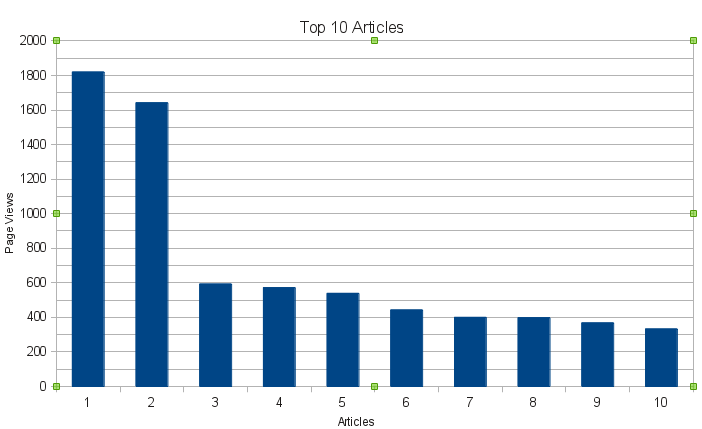 I’m somewhat surprised about the volume of page views for the first two posts on the list, particularly the first one. While the post on “Revolutionary Technology in Formula One: The Monocoque Chassis” was always intended as part of a series and I might have expected some interest based on that, I’m surprised that the subject of monocoque chassis layout doesn’t have more representation on Google, given its status as an imperative part of modern automotive design. Similarly, I’m quite shocked at the page view count for “Variable Types in C: Auto, Static, Register and External – A Brief Guide”. Again, I would really have expected there to be more material present on Google for the subject. What’s more, the article was not originally written for A Technophile’s Indulgence – it was part of a series of articles written as tutorials back when I was studying C in college and found myself rather adept at it while others were struggling. In any case, I think this shows that continuing along the lines of technical articles might not be a bad idea as I continue to write. Here’s to the three years passed – and perhaps to three or more years into the future!